What comes to mind when you hear the words “gooey and sticky?” If you’re a boater, hopefully it’s not your bilge! How about cinnamon buns, also known as “sticky buns?” Those gooey, sticky swirls of light dough that pull apart casting an aroma of cinnamon, a hint of buttery sugar, with delicious plump raisins scattered throughout. 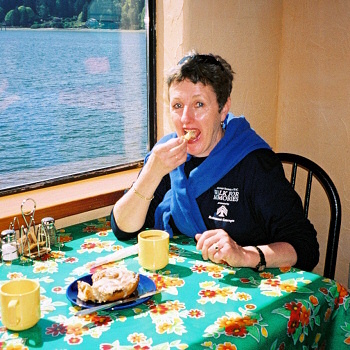 Although boaters can make cinnamon buns in a baggie (Pacific Yachting, April 2004), most bakeries offer these irresistible delights. But one thing is certain: not all sticky buns are created equal, as we discovered during our search for the best bun in the southern Gulf Islands of British Columbia. Arising early in our well-appointed Catalina 34′, we made a beeline to the Deli for a breakfast of sticky buns. Yummy … after just one bite we decided they were good, they were very good. But were they the “world’s best”? Dawn mentioned the Sidney Bakery downtown also made sticky buns. Grabbing a few extra buns, we motored the short distance to Sidney Marina, tied off and walked to the nearby bakery. Now for the test. Back at the boat, we carefully sampled the buns from each of the two bakeries. Both were great tasting but we gave a slight edge to those from Sidney Bakery. So, Harbour Road Deli doesn’t make the best sticky buns in the world; we had just found one better. Before searching the rest of the world’s bakeries, we decided to try and find the best sticky bun in our cruising area over the next week. Besides, we had to eat breakfast every day anyway! Our first task was to develop a sticky-bun rating scale. On a scale of one to ten, we agreed that a “1” rating would represent a bun requiring copious amounts of coffee to wash it down; a “5” rating would be equivalent to the commercial variety found in many retail outlets, and a “10” rating would be “to die for, heavenly, sinfully delicious, over the top.” We agreed that a bun receiving a 10 rating would be of ample size, soft and sticky throughout, chewy but not doughy, sweet with a distinct cinnamon flavour, lightly glazed with white icing and have lots of swirls that pull apart easily. You want to lick your fingers afterwards and the whole bun tastes like the heart. In our quest for the best, we found several buns that came close to this description, but only one that matched it exactly. Buns that received a 9 or 8 rating we described as “Great,” those with a 7 or 6 rating “Good” and those with a 5 rating “OK.” No buns received less than a 5 rating, except one that got misplaced in the galley for three days! We then established standardization criteria: for the convenience of boaters, bakeries had to be within a 5-minute walk of the dock or anchorage; all buns had to be baked on the premises, be purchased fresh and eaten that same morning without further heating. While some sticky buns come adorned with pecans, apples, or cream-cheese icing, we restrained ourselves by only eating “regular” buns which may or may not have had raisins and white icing. We were fortunate with the weather. Every day was sunny and warm with light winds at least part of each day — a perfect week for touring bakeries. We asked other boaters and checked the Yellow Pages to locate bakeries between Sidney and Nanaimo. Our first stop was Cowichan, where we tied to the newly rebuilt docks at the Dungeness Marina. 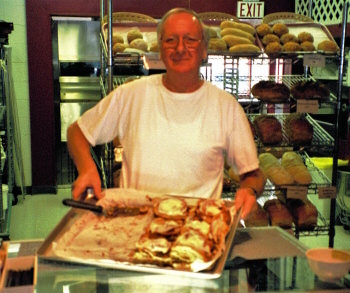 Just down the street was the True Grain Bread shop, specializing in organic breads. The next morning when we asked for sticky buns, the clerk just smiled and said, “Sorry, we only make healthy food here.” Our quest continued. In Chemainus, we took the self-guided walking tour of their historic murals and scoped out two bake shops, Small Tall Treats and the Chemainus Bakery, where we bought buns the next morning. Holy Doodle! In the window of Small Tall Treats was a Times Colonist newspaper clipping describing a recent survey of sticky buns on Vancouver Island. In a taste test, conducted by three media people, sticky buns from Small Tall Treats were rated “second place” while those from Old Town Bakery in Ladysmith were rated “Best on the Island.” Their survey did not include the Gulf Islands; ours did not include Old Town Bakery, which was a half-hour walk from the nearest dock so we passed it by on our way north, anchoring in Nanaimo Harbour. The next morning, we docked in Nanaimo and rated the sticky buns at Lila’s Specialty Bakeshop. We also tried the buns at Javawocky Coffee House on the waterfront; but being whole wheat, we decided not to rate them. We then sailed to adjacent Gabriola Island and anchored in Taylor Bay so that we could pick up a few buns at the nearby Twin Beaches Bakery. Near slack current, we motored south through Dodd Narrows, anchoring in Princess Bay at Wallace Island. Having just read “Once Upon an Island” by David Conover, I felt like the local tour guide showing Sandy and our friends around the island on which the Conovers lived and struggled to build a small resort in the 1950’s. On Sunday, we docked at Montague Harbour Marine Park for lunch and beachcombing. Reportedly, an enterprising baker sells sticky buns from a converted tugboat in the harbour during the summer months. Not wanting to wait, we motored to Ganges on Salt Spring Island in order to be first in line Monday morning for our bun fix at EMBE Bakery and Barb’s Buns. After browsing through a few galleries and specialty shops in this quaint village, we close-hauled to Royal Cove on Portland Island — the perfect stop for a picnic on a fine shell beach. A well-maintained path invites exploration of Princess Margaret Marine Park, which encompasses the entire island. Our last evening was spent at Fulford Harbour Marina, also on Salt Spring Island. At Tree House South for breakfast we sampled our final sticky buns of the tour. This business also runs an outlet in Ganges but the baker informed us that all their buns are made here and some delivered to the Tree House Café in Ganges. After a belly-full of sticky buns, we stopped at Sidney Spit for a calorie-burning walk on the beach, which wasn’t long enough! We then returned our boat to the Cooper dock in Sidney. In total, we tasted and rated sticky buns from 9 different bakeries (see below). Perhaps there are other bakeries that we were unable to visit during the week; however, of those we visited, in our collective opinion the absolute best sticky buns in the southern Gulf Islands were from … drum roll please … Twin Beaches Bakery on Gabriola Island. Tied for second place were buns from Sidney Bakery in downtown Sidney and Tree House South at Fulford Harbour. The “best sticky buns in the world” from Harbour Road Deli in Sidney actually came in third place — still a great bun. One proviso of this taste-testing tour: our rating of a sticky bun in a particular establishment may not reflect the quality of their other baked goods. For example, while the sticky buns at Lila’s in Nanaimo were rated “7”, the apple strudel that I couldn’t resist would definitely have taken the blue ribbon in a German bakeoff. Also, in our ratings no consideration was given to price, which ranged from 70¢ to $2.95. Certainly the best value for money would be the “great” sticky buns at Sidney Bakery for only 70¢ each. So, the next time you’re boating in the southern Gulf Islands and craving a freshly-baked, sinfully delicious sticky bun, you’re likely not far away from one of the bakeries on our list. Start at the top if you want a sticky bun to die for.